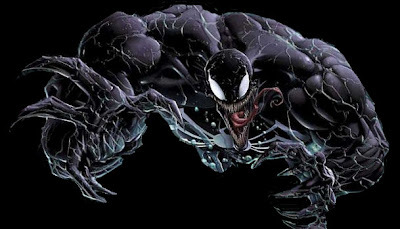 Back in July, Schofizzy broke news that Sony & Marvel were developing a Venom spin-off film for the big screen. Sony hired Rhett Reese and Paul Wernick to pen a script and news comes this week, that the duo have turned in their first draft of the "Venom" film. Coming Soon recently spoke with the two while on a set visit for Zombieland and asked them a couple things about the "Venom" film. Unfortunately, due to a non-disclosure agreement they have with Sony, they were not able to disclose anything about the script other than it is complete and they are awaiting word back. "Venom is something that we're very fired up to be writing," Reese told Coming Soon. "We have turned in a draft and are waiting to hear back, so it's early in the process. But it's a thrill to be writing 'Venom' for obvious reasons." One thing that everybody would like to know is if their draft follows what happens in Spider-Man 3 or if the spin-off will start from scratch. While they wouldn't explain the details of the script the duo had a bit to say about creating the story. "Obviously, with a character like Venom there's a ton of stuff to draw from," Reese tells Coming Soon. "Then they had specific rules about the villain and the backstory and stuff like that, so there were certain things they wanted us... certain parameters they gave us." Reese and Wernick explained that alot of time and thought has gone into the script and it is very much a collaborative effort. "Largely we pitched them something and they liked it but they had changes, so we worked on the outline for a long time and then we wrote the script. So with Marvel and Sony and us it's definitely very, very collaborative," Reese concluded. So, while no real details were revealed about the "Venom" script, but do know that a draft is in and the wheels are definately turning for the spin-off. I personally hope they script overlooks Spider-Man 3 or at least creates one of Venom's other ego's not being Eddie Brock.